Another salad recipe?? Yes! Another salad recipe. We really enjoy making a salad for dinner; it’s fresh, it’s cool, it’s delicious. Cheryl usually does all the hard work like making the dressing, chopping up stuff and all I do is grill the meat and I get ALL the glory. What can I say; meat always get’s top billing. The week we collaborated on one of our favorites…the Oriental Chicken Salad. I got this recipe from my sister, Diane, about 10 years ago. She originally made it as a side dish for a family gathering and it was a big hit. I just added some grilled teriyaki chicken to turn this salad into a meal. 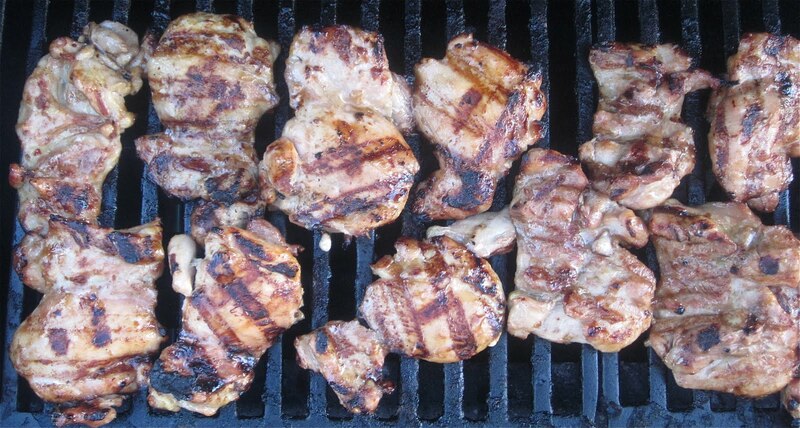 I started by marinating my chicken in Paradise Teriyaki Sauce by Cajun Island. I picked up a bottle of this at the Fiery Foods Show last month. I really liked this sauce; it had a nice mild flavor and didn’t burn on the grill. I’m looking forward to using this again. 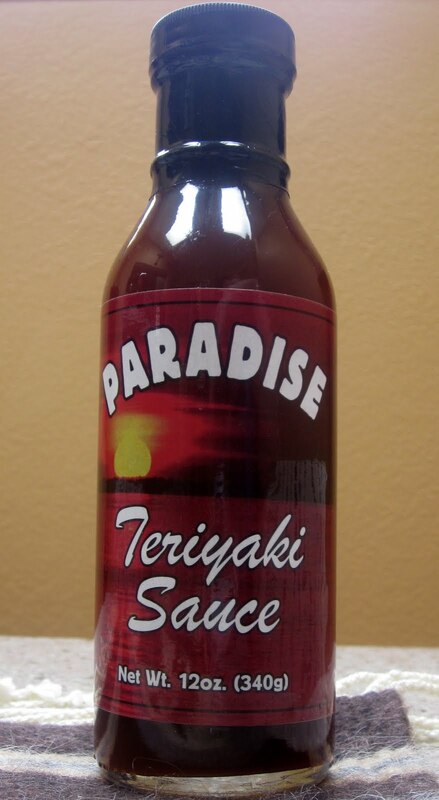 ¼ cup teriyaki sauce, I used Paradise Teriyaki. 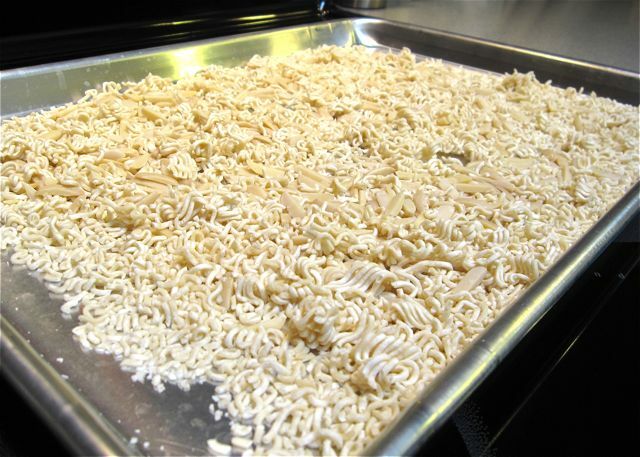 On a large cookie sheet, crumble the 2 packages of ramen noodles, add the sunflower seeds and almonds and spread evenly across the cookie sheet. Bake at 350F for 8-10 minutes or until golden brown. Remove from oven and allow to cool. Once cool, don’t start eating them or you won’t have any for your salad. Mix the sugar, olive oil, vinegar and soy sauce in a saucepan and bring to a boil, stirring frequently. Remove from heat and allow to cool. 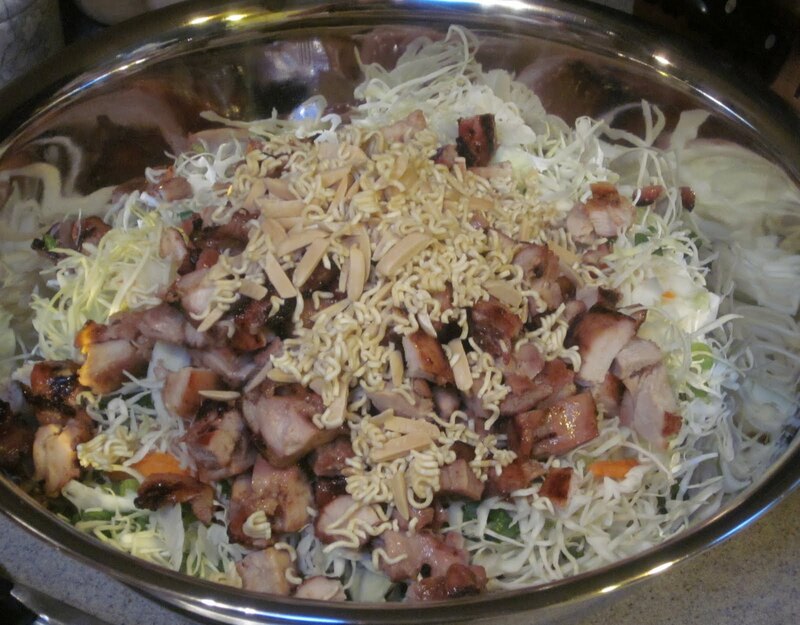 In a large salad bowl add the bok choy or cabbage and onions in a large bowl. Add the chopped chicken and cover with dressing and toss. Top with toasted ramen noodles. Makes 6-8 servings. In real people servings that’s more like 4, but it’s mostly vegetables, so that’s ok, right? After one bite of this salad, you will know why it’s become one of our favorites. The dressing is really amazing, it”s sweet, tangy and salty, and would be a great sauce for egg rolls, spring rolls, fried wontons, etc. 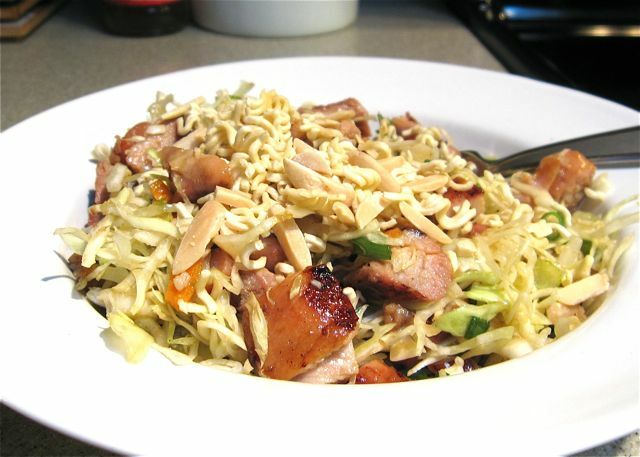 Although the addition of grilled chicken makes it a meal, the real star of this dish is the ramen noodles, combined with the nuts they just add that crunch that makes this salad so darn good. Like I said before, don’t start eating the ramen mixture before you assemble the salad or you won’t have any left. Two salad recipes in less than a month, do you think I’m getting soft? Probably, but it does help to get some veggies in the system whenever ever I can. However both salads had grilled meat, so I think that makes it a man-salad. Hope you all enjoy the recipe and let me know how yours turns out! Have a grate day! Looks good, but no chop sticks…what's up with that? This reminds me of that slaw with ramen noodle and I liked that one. I'll be trying this one, nice, crunchy, Asian flavor profile, and I get to play with fire.